In Ottawa, flooding and basement leaks are common problems. If you’re looking to waterproof your home, we can provide several options to help keep your basement dry. Using a multi-layer solution is the best way to protect your home and minimize unseen dangers. Backwater valve installation. The backwater valve is a one-way valve between the city sewer line and your house. It allows water to flow from your house to the sewer but prevents the water from flowing in the opposite direction. Weeping Tile. These are pipes that transmit groundwater away from your home to a collection point, like a sump basin. The pipes may be installed around the outer or inner perimeter of the home. Sump Pump. A sump pump consists of a sump basin located beneath your basement floor, and a pump. Water is collected in the basin, where it is sent away from the house. When installing a sump pump, it is best to install a backup power system. This allows for the pump to work during a power outage caused by a storm or other fault. How Does a Sump Pump Work? Your house may not need a sump pump. The best way to determine your house’s waterproofing needs is to call us for a free, no-obligation inspection. We’ll assess your home and determine which solutions should be applied. A sump pump works by being connected to your weeping tile. Water is collected by the weeping tile and drains into the sump pump basin. When the water rises to a specific level, the sump pump turns on automatically to drain the sump basin. The water is deposited pipes to a place away from your home’s foundation. For the best operation of your pump, it should be installed by a licensed professional plumber like Dr. Pipe Drain and Plumbing Services. We install each of the components and make sure the connections between them are solid. In our installation process, we consider the optimum position to place each item for maximizing flood prevention. 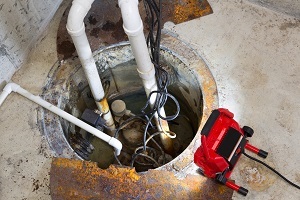 Selecting us for your service means that you can save on sump pump installation. We can guide you in applying for rebates from the City of Ottawa that drastically reduce your project costs. Pumps may be automatic (with a backup power supply) or manually driven. Manual ones may be cheaper, but the automatic pumps are usually recommended in most cases. When choosing a sump pump, you should consider factors like horsepower, voltage, cord length, and backup power sources. It’s a lot to consider. We’ll work with you to decide if you need a sump pump and the best one for your home. What Does a Sump Pump Cost with a City of Ottawa Rebate? Each sump pump installation is different. It’s best if you call us for a free, no-obligation inspection. This will help us determine what system components work best for your needs and your budget. We can provide assistance with preparing the paperwork to take advantage of rebates offered by the City of Ottawa. Many companies offer licensed plumbers, but Dr. Pipe Drain and Plumbing Services also offers respect for your home and your time as our standard. This means from the time you call us, we are committed to making your entire experience as customer efficient as possible. We coordinate times that work with your schedule, and call when we’re on our way. Our plumbers keep our areas neat and covered while working. In our projects, we use the most appropriate solutions to work quickly and professionally. Our strengths do not only lie in plumbing. We can also help navigating the insurance companies and bureaucratic red tape. You will receive all the necessary permits for our jobs. We will guide you through the City of Ottawa rebates for which you qualify. Our customers love us, and our work is the best quality. Stop by our testimonials page, and then give us a call to for a free, no-obligation quote for sump pump installation in Ottawa.